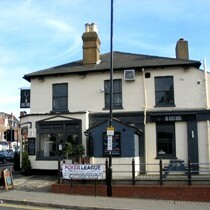 The Victoria in Victoria Street opened on 1st April 2010 and replaces the Glass House that closed in 2009. Prior to the Glass House this pub was called The Clanned and before that The Acorn. London Pride and Deuchars IPA real ales available, although the Deuchars cost £3.20. Newspapers are available and Sky Sports is shown on the two plasma tvs. The pub is smart inside and the welcome was friendly. Background music was played although this felt a little loud and rocky for the early evening. On a sunny evening the terrace with its ten or so tables around the side and back will be a nice place to eat and drink. Food is available from midday-3pm and 5-9pm Mon-Fri and midday-7pm at weekends. Much of the food on the menu is popular English style food available from around £7 for a main course. Review date: 16th June 2010.